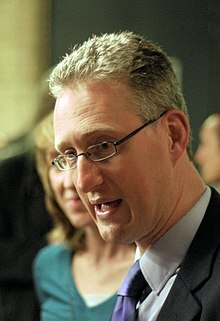 Lembit Öpik (/ˈlɛmbɪt ˈoʊpɪk/, Estonian: [ˈlembit ˈøpˑik]; born 2 March 1965) is a former British politician. A member of the Liberal Democrats, he served as a member of parliament (MP) representing the constituency of Montgomeryshire in Wales from 1997 until he lost his seat at the 2010 general election. He was the leader of the Welsh Liberal Democrats from 2001 to 2007. Öpik stood unsuccessfully for the position of President of the party in 2004 and 2008. He was also unsuccessful in a bid to become the Liberal Democrats' nominee in the 2012 London mayoral election. Beyond his political work, Öpik has also been in the public eye through his appearances on several television shows, and as a result of his personal relationships with ITV weather presenter Siân Lloyd and with pop star Gabriela Irimia of The Cheeky Girls, which drew considerable media attention. Öpik's parents were from Estonia, but after the Soviet occupation under Joseph Stalin, they fled to Northern Ireland. Öpik was born in Bangor, County Down, the elder son of Liivi Öpik (née Vedo) and physicist Dr Uno Öpik (19 October 1926 – 6 May 2005), and grew up there with sister Urve Öpik (born 1960, a psychotherapist) and brother Endel "Tal" Öpik (12 April 1968 – 21 November 2005, a musician). His grandfather was Ernst Julius Öpik, an Estonian astronomer who worked at Armagh Observatory. Öpik was educated at the Royal Belfast Academical Institution before going on to the University of Bristol, where he completed a degree in philosophy. He served as the President of the University of Bristol Union (1985–86), and as a member of the National Executive of the National Union of Students (1987–88). In 1988 Öpik joined Procter & Gamble in Newcastle upon Tyne as a brand assistant. In 1991 he became corporate training and organisation development manager, and was promoted to be global human resources training manager in 1996. Öpik was elected to the Liberal Democrats' Federal Executive Committee in 1991. He was elected as a councillor on Newcastle City Council in 1992. Öpik stood unsuccessfully as a candidate for Newcastle upon Tyne Central in the 1992 general election, and for Northumbria in the 1994 European Parliament elections. At the 1997 general election, the Liberal Democrat MP for Montgomeryshire, Alex Carlile, retired and Öpik successfully stood as the Lib Dem candidate. He retained the seat at the 2001 general election and at the 2005 general election, increasing his share of the vote by 3.5% in 2001 and by a further 1.8% in 2005, giving him a majority of 7,173 over the Conservative candidate. However, he lost his seat to the Conservative Glyn Davies following a 13.2% swing in Montgomeryshire at the 2010 general election. Öpik served as the Liberal Democrat spokesman on education (1997), Northern Ireland (1997–2007), Wales (2001–07), business (2007), and housing (2007–08). During the 2001–05 Parliament, Öpik was a member of the Environment, Food and Rural Affairs Select Committee in the House of Commons. He was the joint chair of the Middle Way Group, a cross-party parliamentary group which supported the regulation, rather than the banning, of fox hunting. Öpik became leader of the Welsh Liberal Democrats in 2001 following the retirement of Richard Livsey. He stood down in 2007 and was succeeded by Mike German. In September 2004, Öpik stood for the position of President of the Liberal Democrats, but was defeated by Simon Hughes. The party president chairs a number of party committees and also represents the party at official functions. In 2008, a campaign amongst grassroots party members backing him as a successor to Hughes, under the slogan "I Pick Öpik", emerged at the party's 2008 spring conference in Liverpool. On 24 September, Öpik announced that he was standing down as the party's housing spokesman to concentrate on a campaign for party president. However, in the party ballot in November, Öpik was defeated by Baroness Scott of Needham Market by 20,736 votes to 6,247. In successive Liberal Democrat leadership contests, Öpik gained a reputation for backing campaigns that soon collapsed, leading some to talk of the "curse of Lembit" making his backing undesirable. In 1999, he was one of only two of the party's 46 MPs to back the abortive leadership campaign of Don Foster. Foster abandoned his campaign before nominations even closed, and backed Charles Kennedy, the eventual winner, instead. During the 2006 leadership contest, Öpik was initially a strong supporter of Kennedy, who then stood down. Öpik subsequently became campaign manager for Mark Oaten. However, Oaten quickly withdrew from the contest, having failed to attract enough support from within the parliamentary party; his only backers were Öpik and Baroness Ludford. In the 2007 leadership election, Öpik declared his backing for Nick Clegg, and when Clegg won the election Öpik said "My man won, so the curse of Öpik has at last become a blessing". Öpik supported Jenny Randerson in the 2008 contest for leadership of the Welsh Liberal Democrats. Randerson lost to Kirsty Williams. Öpik supported Tim Farron in the 2015 Liberal Democrat leadership election, who eventually won with a margin of 13%. In May 2009 The Daily Telegraph published details of Öpik's parliamentary expenses claims. It showed that in 2008–2009 Öpik claimed £23,083 in second home allowances out of public funds, including various items of furniture and a £40 summons charge for non-payment of Council Tax. Öpik told the Telegraph "I am willing to pay back the £40" but did not offer to repay anything else. The Telegraph also outlined a rejected expense claim Öpik attempted to make for £2,499 for a plasma screen television, after which he bought a TV costing £750. Öpik lost his seat in parliament at the 2010 general election when he was defeated in his constituency of Montgomeryshire by Glyn Davies of the Conservative Party by 13,976 votes to 12,792. This represented a swing of 12.5% against Öpik and a swing of 13.8% in favour of the Conservatives in the constituency. Öpik put himself forward to be the Liberal Democrats' nominee for mayor of London in the 2012 mayoral election, however in the first round of the party's selection ballot, he came fourth with 252 votes and was eliminated from the process. Öpik was a candidate for the Liberal Democrats' federal executive committee in 2012, but was not elected. He also expressed an interest in becoming the Liberal Democrats' candidate for the position of Police and Crime Commissioner for Northumbria Police in 2012. However he was ruled ineligible because he did not have a residence in the region. Late in 2012 he joined Leadenhall Consulting, an HR consulting firm specialising in the insurance and financial sectors, as an associate director responsible for developing training. On joining the firm, Opik explained that training is his "first love". Öpik is a long-time supporter of the Motorcycle Action Group (MAG UK) and a keen motorcyclist. On 23 November 2013 it was announced that Öpik had joined MAG as director of communications and public affairs. In the post he will work on behalf of motorcyclists in the UK and Europe. He presents regular programmes on BBC Radio Kent every Friday morning from 9:00 where he hosts the topical Kent Midmorning phone-in, and every Sunday from 11:00 where he presents a news panel format, digesting the week's local, national and international stories, looking at the newspapers, welcoming expert guests and politicians for discussions as well as taking calls from listeners. He also regularly stands in for Julia George on other weekday mornings. Since 2010, he has broadcast for Press TV, including hosting a news satire show and a number of political news programmes. He currently hosts A Simple Question. On 24 June 2018 Lembit Öpik was elected as the Chairman of the Parliament of Asgardia during the first parliamentary session in Vienna, Austria. "The birth of the new space nation Asgardia" was announced in a press conference in Paris, France, on 12 October 2016 The project is officially called the "Space Kingdom of Asgardia." In the autumn of 2018 Lembit Öpik considered participating in Estonian elections. Öpik said he had been asked to consider being either a member of the Estonian parliament, or to consider running as president. "One position is just to be a member of parliament, which I would not mind doing," he said. "The other position is president of Estonia. It is more than just a non-executive role—I could make quite a big splash. I have not got a campaign plan but I have said I would be interested. It's not an appointed job, I would have to stand for it." Öpik has appeared several times on the BBC satirical current affairs quiz show Have I Got News for You, including an appearance on the day after he lost his parliamentary seat. He has also appeared on the BBC's Question Time and Any Questions? Away from politics he has also appeared on Stand Up for the Week, Al Murray's Happy Hour, All Star Mr and Mrs, Loose Women, Bargain Hunt Famous Finds, Ant & Dec's Saturday Night Takeaway and Come Dine with Me, Celebrity Juice and I'm a Celebrity...Get Me Out of Here! In June 2010 he made his debut as a comedian at the Backstage Comedy Club in London's West End. It was described by one audience member as "not fantastic, but not completely awful". Öpik also gained media attention for his part in a music video by unsigned band The Good Suns. The video featured the politician dancing and miming lyrics to their debut song Pop Wound. In March 2012, Öpik began collaborating with rock band Adam and the Asbos on their action/adventure sci-fi film Adam and the Asbos: The Movie. In April and May 2012, he made appearances in a professional wrestling promotion, appearing from the audience to confront wrestler Kade Callous for cheating; Öpik was in turn challenged to appear in a later tag team match, which ended with Öpik "black and blue". He continues to court media interest and regularly features in the national press, often for trivia. In August 2016 Lembit Opik performed in the comedy 'Rocking Your Vote' in which he played himself. The play was on the Edinburgh Fringe Festival. The main actor was the 2015 MP candidate Will Goodhand (Channel 4’s Beauty and the Geek, 99 Club stand-up). The comedy was composed by Olly Nelken (Pigbag, Royal Marines Band). In 2009 Lembit Öpik published an article in The Guardian named "We need a cosmic plan" about risks of asteroid impact on Earth. Earlier, in 1999, he called on the government to invest between £500,000 and £1m annually in tracking asteroids to avert catastrophe. He wrote a column in the (now defunct) Daily Sport newspaper earning him up to £5,000 a year. With Hilary Bird and Ulvi Mustmaa, he is the author of the Xenophobe's Guide to the Estonians, published by Oval Books in June 2010. In March 2012, Öpik released his first collaborative work with Edward Joyce, The Alternative View, a book discussing the future of the Liberal Democrats in the UK, including a call for the then party leader Nick Clegg to step down as Leader of The Liberal Democrats, but to remain deputy prime minister in the coalition government. The book's cover pays tribute to The Orange Book, although Öpik has often been considered a member of the 'social liberal', left wing of the party. His book All at Sea, a tale about a curious cruise, was published in 2015. Öpik speaks fluent English, Estonian and German. On 13 April 1998 Öpik came close to death in a near fatal paragliding accident. He fell 80 feet (24 m) onto a Welsh mountain in his constituency, and broke his back in 12 places, as well as his ribs, sternum and jaw. This experience caused him to take a keen interest in the Spinal Injuries Association, of which he is a member. He later underwent a series of surgical procedures to correct the damage to the bones in his face. Despite the accident, he continued with his interest in aviation. He talked about the accident to the July 2010 edition of Flaps Podcast, where he recounted his accident and its aftermath. He has since become a glider pilot at the Midland Gliding Club in Shropshire. He holds a pilot's licence and spoke for British gliding in the House of Commons. Öpik also rides motorcycles (he was the chair of the all-party parliamentary motorcycling group when he was an MP), and since November 2013, he has been employed as the campaigns and communications director for the Motorcycle Action Group. Öpik supports the English football club Leicester City. His mother lives in the city of Leicester. He participated in a celebrity edition of The Apprentice to raise money for charity. Sport Relief Does The Apprentice was part of Sport Relief, the Comic Relief/BBC charity initiative that aired on 12 and 14 March 2008. In 2006 he became president of the Motor Neurone Disease Association, following his father's death from the disease the previous year. He and ITV weather presenter Siân Lloyd appeared on Celebrity Who Wants To Be A Millionaire? on 15 April 2006, winning £64,000 for the Motor Neurone Disease Association and Action for Children. The couple came close to marrying, but she ended the relationship in October 2006 and made unflattering comments about Öpik in her autobiography, A Funny Kind of Love. In particular, she cited "women and alcohol" as two things which undermined their relationship, detailing Öpik's "rowdy, drunken behaviour" and claiming that he would drink two bottles of wine in an evening. According to Lynn Barber, the author's "main purpose seems to have been demolishing love-rat Lembit". Öpik later became involved with then-24-year-old Gabriela Irimia of pop music double-act The Cheeky Girls. They split up in July 2008 after a "difficult period" in the relationship. He has one child with his former partner, Sabina Vankova. ^ "Lembit Öpik just got dumped on Twitter, and it was pretty brutal". 8 November 2017. ^ a b "Lembit Opik's joy after first child is born following dramatic labour". ^ "House of Commons Debates for 23 November 2005 (pt 20)". Hansard, House of Commons. The Stationery Office. 23 November 2005. ^ a b Barber, Lynn (14 June 2008). "The interview: Lembit Opik" – via www.theguardian.com. ^ "Vote 2001 – Results & Constituencies – Montgomeryshire". BBC News. Retrieved 7 May 2010. ^ "Montgomeryshire – Aristotle". Guardian Unlimited Politics. London: The Guardian. Archived from the original on 8 February 2009. Retrieved 7 May 2010. ^ "Election 2010 – Montgomeryshire". BBC News. Retrieved 7 May 2010. ^ "Biographical details in The Guardian". London: The Guardian. 13 June 2008. Archived from the original on 9 May 2008. ^ "Opik Leaves Lib Dem Front Bench". BBC News. 24 September 2008. ^ "Ros Scott named Lib Dem president". BBC News. 8 November 2008. ^ "Opik sides with Clegg on Lib-Dem vote". Western Mail. Media Wales Ltd. 3 November 2007. ^ Claire Truscott (18 December 2007). "Clegg's election: reaction in quotes". The Guardian. London. ^ "AM starts Lib Dem leadership bid". BBC News. 3 November 2008. ^ "And the man Lembit Opik is backing for Lib Dem leader is..."
^ Swaine, Jon (13 May 2009). "Lembit Opik forced to pay for own £2,500 plasma TV : MPs' expenses". London: The Telegraph. ^ "Opik to repay tax summons expense". BBC News. 13 May 2009. ^ Mulholland, Hélène (2 September 2011). "Brian Paddick picked by Liberal Democrats for London mayoral race". Guardian Unlimited Politics. The Guardian. ^ "Federal executive committee". Archived from the original on 2012-12-06. ^ "Lembit Opik misses out on Lib Dem top cop bid". Sunday Sun. 9 September 2012. ^ Banks, Richard (10 January 2013). "Ex-MP Lembit Öpik brings a 'fresh approach' to London market insurance training". Archived from the original on 26 March 2013. ^ Pearce, Andrew (15 January 2013). "Lembit Opik tells brokers to be "less risk averse"". ^ "Lembit Öpik adds passion and power to MAG's Communications and Campaigns Team". Warwick: Motorcycle Action Group. 23 November 2013. Retrieved 20 December 2013. ^ "BBC – Radio Kent – Home". www.bbc.co.uk. ^ Osbourne, Paul (3 June 2010). "Former MP Lembit Opik begins comedy career in London". BBC News. ^ "The Good Suns – 'Pop Wound' video". NME. Retrieved 4 March 2012. ^ "Lembit Releases His Inner Space Cadet". Evening Standard. 21 March 2012. ^ Allen, Emily (17 April 2011). "Can this man sink any lower? Lembit Opik dragged into the ring after picking fight with an 18 stone wrestler (but it was all for show)". Daily Mail. London. ^ "Ex-MP Lembit Opik 'black and blue' after wrestling bout". BBC News. 4 June 2012. ^ Infante, Francesca (24 August 2013). "Ex-MP Lembit Opik bitten in the GROIN by a sausage dog". Daily Mail. London. ^ "'Invest to avert armageddon'". BBC News. 3 March 1999. Retrieved 8 June 2017. ^ Withers, Matt (6 March 2009). "Tabloid columnist Lembit Öpik rounds on the red tops". WalesOnline. ^ Bird, Hilary; Opik, Lembit; Mustmaa, Ulvi (7 May 2010). Xenophobe's Guide to the Estonians. ISBN 978-1906042301. ^ "Lembit Öpik: There's more to the cheeky boy than his love-life". The Independent. London. 17 March 2007. ^ Higgit, D. (27 August 2007). "The day my life changed". Western Standard. Archived from the original on 18 January 2008. ^ "Liberal Democrats -Öpik". Libdems.org.uk. Archived from the original on 16 April 2009. Retrieved 2 June 2010. ^ "Spinal Injuries Association webpage". Spinal.co.uk. Retrieved 7 May 2010. ^ "Lembit Opik gets face reconstructed years after crash" – via www.belfasttelegraph.co.uk. ^ "Your MP Identified". CBBC Newsround. BBC News. 13 November 2002. ^ "House of Commons Debates for 5 June 2003 (pt 13)". Hansard, House of Commons. The Stationery Office. 5 June 2003. ^ "Lembit Öpik to appear in Sport Relief Does The Apprentice for charity". Charities Aid Foundation. 28 February 2008. ^ "One hell of a cheek ... How my fiancé Lembit Opik flaunted his Cheeky Girl, by Sian Lloyd". Daily Mail. London. 24 March 2008. ^ Barber, Lynn (15 June 2008). "Interview: Lembit Opik". The Observer. London. ^ "Cheeky Girl dumps MP fiancé Lembit". IMDB. 13 July 2008. ^ "BBC NEWS – Election 2010 – Montgomeryshire". BBC News. Wikimedia Commons has media related to Lembit Öpik. Evening Standard (London); "Lembit and his Very Cheeky Family"